and Mani and Aloy Perera are angry about the solar panels. 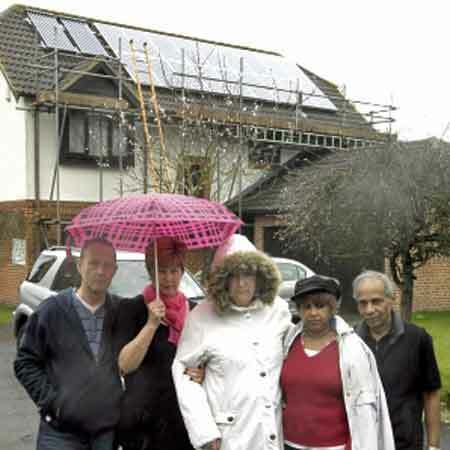 A neighbourhood dispute has erupted in Finchampstead after a couple installed solar panels on their roof. Patrick and Gillian Flynn, who live in Moor Close, off Barkham Ride in Finchampstead, have south-facing solar panels to heat their water and power their home. Some neighbours have complained the panels are an �eyesore�, adding they are on a �near-industrial scale�. Ian and Maureen Smith, who live across the road from the house, say it has become a �blot on the landscape� and the solar panels should be re-sited on the back of the house where they would not be overlooked. This page contains a single entry by DaveH published on April 30, 2010 8:05 PM. The Deepwater Horizon disaster was the previous entry in this blog. I knew it! is the next entry in this blog.